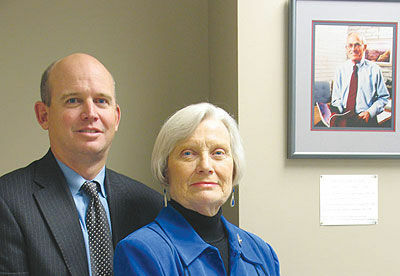 Jan Harelson is pictured in 1998 with her son, Matt, in the Hugh Harelson Reporting Laboratory. Dorothy Jan Harelson, longtime supporter of the University of Arizona School of Journalism, died Friday night after complications during heart surgery. She was 78. Although she never worked as a journalist, she was a champion for the trade and is credited with helping to advance the UA journalism program over the past 15 years. Harelson was born on Oct. 15, 1937, in Jacksonville, Illinois and moved frequently as a child, eventually making her way to Tucson. She graduated from the UA with a degree in education and met her future husband, Hugh Harelson, while he was working as the Southern Arizona correspondent for the Arizona Republic. The couple was married in 1958 and had been together just short of 40 years at the time of his death in 1999. After the birth of her two sons, Matt and Scott, Harelson returned to school and received her masters degree in education from Arizona State University. She taught elementary school in Tucson and Phoenix area schools for decades, spent time working in social services and even opened a quilt shop in Tucson in the early 1970s. A graduate of UA’s journalism department, Hugh remained devoted to the program and its continued success. In the mid-’90s, when the UA’s journalism department was threatened by budget cuts, the Harelsons and a group of like-minded individuals stepped in to help. She remained active with the school for the 15 years leading up to her death, starting an endowment that’s funded a teaching award and created the school’s computer lab, the Hugh Harelson Reporting Laboratory. The endowment’s financial support also allows for updates in the lab’s equipment to keep the instruction current with technology and the journalism trade. Despite all of her loves — journalism, teaching, traveling, reading and the outdoors — her true passion was her family, her son Scott said, adding that each of her five grandchildren has a quilt she made just for them. “When she found out that Sara’s minor was going to be journalism, she was just so excited to know that one of her grandchildren would be taking classes in Hugh’s journalism lab,” Matt Harelson said. A celebration of Harelson’s life will be held in Phoenix, but the family hasn’t set the date yet. Those wishing to honor Jan Harelson can make donations to the University of Arizona Foundation’s Hugh and Jan Harelson Endowment in Journalism. In addition to her two sons, Harelson is survived by her sister, Jill Tench; and five grandchildren, Sara, Claire, Kate, Haley Rose and Hugh Grayson.